New Item! Expected to Ship 05-25-2019. 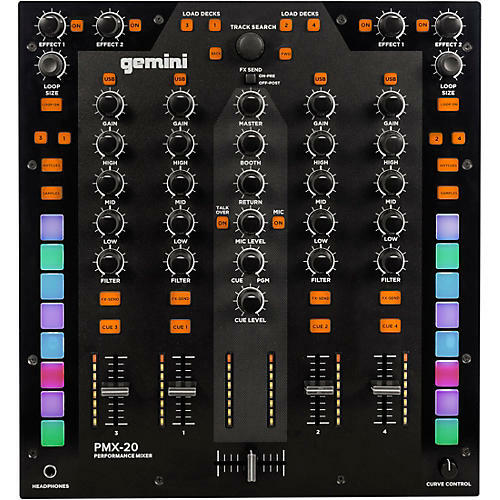 The Gemini PMX-20 is a rugged 4-channel DJ mixer. It combines the power of a 8 in/8 out audio interface and the convenience of a full MIDI implementation. This battle-ready digital mixer also includes a MIDI controller, workflow options and a soundcard in one package. Eight responsive multi-color pads per side provide convenient triggering of hot cues and samples. The inner chassis and replaceable crossfader means this mixer will be part of your DJ rig for many years to come. The rugged chassis is also designed to stand up to demanding use. Th Gemini PMX-20 mixer caters to multiple device connectivity. Its combo TRS/XLR mic input, microphone input with Gain control and talkover, recording output, 4 Phono/Line stereo channels give you a layout of the right connections you’ll appreciate. If you’re looking for flexibility, look no further for a DJ mixer-style MIDI controller. It can be used by beginner or studio professional because it delivers flexible creative control for the ultimate DJ mixer controller experience. The make and design of the PMX-20 is at the right price with faders, hot cues, effects and loops, all at your fingertips – a true integrated performer.